DIAL: White dial with luminous indexes. Black racing style baton hour minutes hands, red chronograph seconds hand, black ‘apollo’ chronograph minutes/hours register hands. CASE: 42mm, Stainless Steel, black tachymeter bezel, seahorse logo on the caseback. Additional red protective case (heat shield). CONDITION REPORT: New, unworn. Full set with box, warranty and limited series cards, hangtag, caseback sticker, etc. 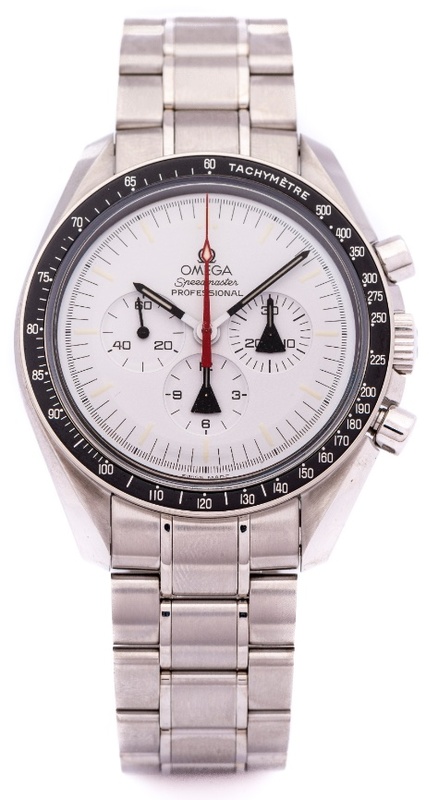 Several prototype Speedmasters were developed in the 1970's by Omega in order to improve upon the special needs of NASA in extreme conditions. The most notable are the Alaska Project series. The special dials and cases were not produced in large series for the public and were prototypes for the Alaska Project series, developed for NASA. This limited edition of 1970 pieces is a tribute to this special series.